He said the troops were always on his mind, adding that "he had always woken up thinking about them and the conditions they operated". "I will support you to play your constitutional role of defending the integrity of the country from both internal and external forces. "This is the oath you have taken just as I took an oath as the President and Commander-In-Chief. "I assure you that I go to bed and always wake up thinking about you and the conditions under which you operate." 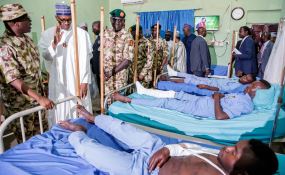 However, Mr Buhari who has been flayed by critics over the carnage asked the troops to maintain their loyalty and defend the country. "Whatever happens, a military no matter how equipped or how well led, without discipline is no use to the country," he said.